Si vous êtes un amoureux de la nature cet endroit est pour vous. South Beach dispose de jardins de légumes, herbes et de fleurs vastes pour les amateurs. Mots-clés: Construit en 2010. Cette maison offre de belles vues Towhill et de l'Alaska à partir de votre balcon. L'intérieur dispose de deux baignoires (une avec vue sur l'océan) avec douches séparées et une Wolfe rang 8 du brûleur. Tous les appareils et oreiller haut-lits sont neufs. Entouré de magnifiques jardins et la forêt ancienne. Profitez de notre nouvelle ferme (oméga 3) des œufs livrés à votre porte. Du poisson pour la truite arc dans notre étang. Un Boston Whaler 19 'avec une console centrale, des downriggers et un moteur 110hp peut également être loué à la journée. 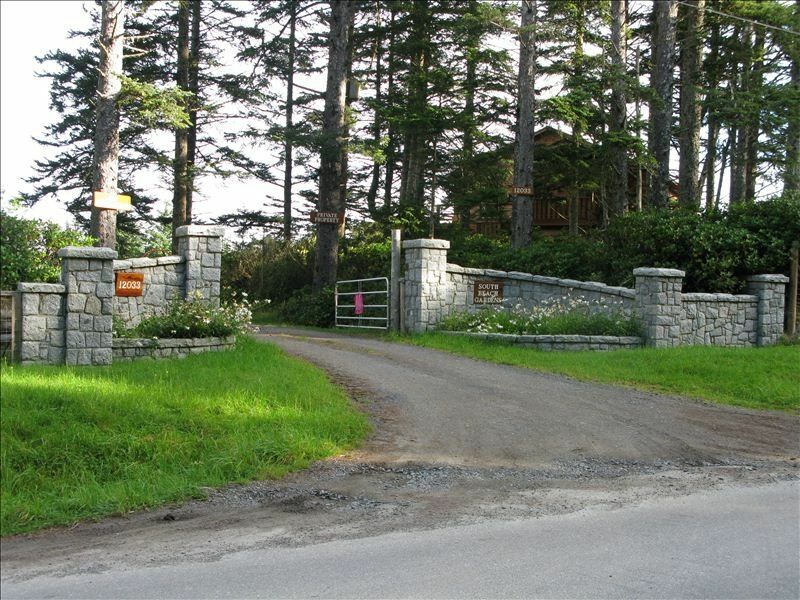 The carraige house is a short drive from Masset and right on the beach. The house is beautiful and the grounds are amazing! Delbert was incredibly helpful with information about where and how to crab and fish, very nice man. The house has an amazing kitchen, the beds are sooooo comfortable, the table chairs are very nice to sit in and play cards, the couch was cozy and a great place for a nap. You can sit in front of the giant sliding glass doors and enjoy the waves as you drink your morning coffee from the espresso machine. Everybody was so nice and accommodating, 100% we would go back and would recommend this rental to everyone we know. Everything about this property was better than advertised. The beds were comfortable. The bathrooms were large and spacious. My daughters loved the rock theme in the bathroom and the jetted tub with a view of the ocean. The kitchen had everything we needed and more. The gardener was so helpful and friendly. My daughters loved the trout pond. I loved the miles of sand on the beach. My mom loved the fact that there were laundry facilities. She spent hours hunting for agates on the beach. We would highly recommend this place to anyone who asks and Jody was extremely helpful and friendly. Reassuring about B.C. ferries bookings when I needed it right down to my last minute question about a gas station to get back to ferry. We enjoyed the artwork on the walls and the couches and dining chairs were comfy! Forgot to mention. Everything was very clean! Great view, lovely accommodations, very helpful hosts. We stayed for 5 nights and enjoyed the house and property. The fresh eggs and veggies were a real treat and we were impressed by the kitchen facilities. The beach was gorgeous and gave us several hours of pleasure as we picked up agates, rocks and shells. We would definitely go back if ever out this way. The property is on a beautiful stretch of beach. The king bed was comfortable. The view from the deck was awesome. The rooms were large and well decorated ( with a large beautifully carved totem pole by the fireplace). Lots of windows let in light during the day and the stars at night. There was a plentiful supply of firewood for fires every night. Richard brought us fresh coho and halibut shortly after our arrival. Jody greeted us with a glass of red wine. We had fresh eggs whenever we wanted. As well there were veg. to be had in the greenhouse. The only thing that reduces the rating from 5 stars is the couch and dining chairs. We found them uncomfortable. Situé à une courte distance en voiture de North Beach, Naikoon Park et Towhill. La maison dispose de magnifiques levers et couchers de soleil vous balcon. River pour pêche à la truite une courte distance de marche. Très bien situé pour la plage peignage, crabe, et la randonnée. Ai-je mentionné que les propriétaires sont vraiment sympa et très arrangeant?